The price of gas barely moved during the past week, with the average U.S. price of a gallon of regular unleaded falling about a penny to $3.29, although the cost of fuel along the East Coast did fall about two cents per gallon. Price increases of about one to two cents in the Midwest offset the East Coast declines to keep the U.S. average from falling any further. The figures are detailed in the regular weekly gas price survey released by the Energy Information Administration. Meanwhile, truckers felt a torrent of increases in prices at the pump, with the national average of the price of diesel rising almost five cents per gallon. 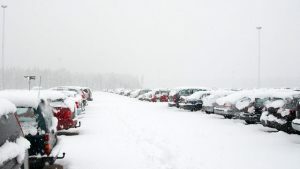 But in the Northeast and along the Central Atlantic, which have been hard hit by winter storms of late, the cost of a gallon of diesel rose as much as 14 cents per gallon in one week. For truckers and other haulers, the price increases were a grim reminder of the volatility of diesel prices during the winter season, when refineries can sometimes struggle to keep up with demand for home heating oil, propane and natural gas. The EIA reported that demand for distillate consumption, a category of fuels that includes heating oil, had risen ballistically in the past four weeks. As of the end of January, refineries were pushing out an extra half-million barrels per day of distillate fuels. The EIA has further reported that inventories of distillates fell nearly 20% through January 24, with additional declines in inventory expected through the week as a new bluster of winter weather buries the Plains, the Midwest and the Northeast. Apocalyptic winter weather conditions are playing havoc on diesel prices as much as they are causing treacherous driving conditions. Photo: PhotoDune.net for TurnpikeInfo.com. The rise in diesel prices has been met with even higher surges in heating oil and propane costs. Home heating oil rose about 12¢ per gallon during the week last week, but propane prices soard by $1.05 per gallon last week, the biggest one-week increase since 1990, the EIA reported. Taken in the aggregate, the surge in demand and the corresponding increase in prices has meant drivers of diesel vehicles, particularly truckers, have suffered a hard hit at the pump. Meanwhile, futures prices have been creeping higher during the past week. Contracts for West Texas Intermediate, for early March delivery, have been slowly edging toward the $100 per barrel mark, a dubious milestone not seen since the end of December. Prices have been hovering between $96.67 and $98.07 per barrel for the past several days, although prices at mid-week were down slightly. For Brent Light Sweet Crude, the news is slightly different, with the benchmark’s intercontinental exhanges hovering in a narrow range near $106 for the past several days. Editor's Note: The original story reflected the national average price of a gallon of gas at $3.30 per gallon, which was incorrect for the week of February 3. 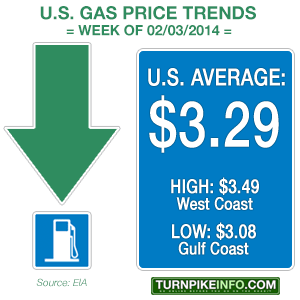 The price has been corrected to $3.29 per gallon.